Continuing my massive deep dive into all things Blue Rose and AGE I want to talk about +Green Ronin Publishing's Fantasy AGE RPG and it's supplement the Fantasy AGE Bestiary. I am reviewing both the PDFs and the Hardcover books. A note. These books "feel" right. They are roughly the size of the original AD&D hardcovers (144 pages each). All is needed now is a Game Master book that has a bunch of options for various Fantasy campaigns and you would have a nice three-volume set that is only a slip-case away of being 150% more fantastic. I don't say the following lightly. Fantasy AGE could give Castles & Crusades a run for my 2nd Favorite set of Fantasy Rules. (D&D and it's variants are #1). Yes. It is that much fun. It is better than Pathfinder, 13th Age and pretty much everything else. Hardcover, full color, 144 pages. $29.95 for hardcover, $15.95 for PDF. The book is full color, the PDF is bookmarked with a hyperlinked index. 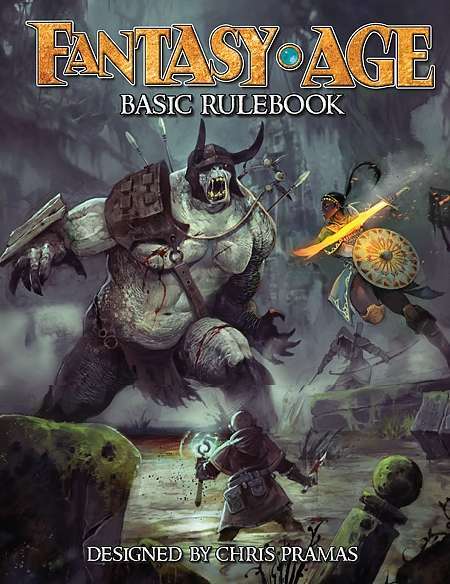 Fantasy AGE is the "generic" Fantasy game based on the ruled that appear in both Blue Rose and DragonAge. While there are some repetitions, the tones of all three games are sufficiently different enough to make each book worthwhile. Chapter 1 gives us the basics of Character creation. The Usual Suspects are here; Elf, Dwarf, Human, Halfling, and Orcs. You get your Backgrounds with some basic ideas. And our three AGE classes; Mage, Rogue, and Warrior. Too bad the classes are not Adept, Guardian, and Expert. Also included here is the experience for level advancement table. Chapter 2 discusses the AGE system. I am not sure if the AGE system will ever "fall into the background" the same way d20 or Unisystem do for me, but it could get really, really close. The system itself is very easy to grasp. In AGE you really only need three six-sided dice. Two of which should be the same color. The off one is called the Drama Die. We will get to all those in a bit. The rolls of 3d6 + Ability +/- mods vs. Test Difficulty are simple enough. Test Difficulties start at 7 (Routine) and increase by 2 for each level. So 9 is Easy. The feel is the same as d20's Target Numbers or even Unisystem's Success Levels. Like most systems, an "opposed" test will be one set of rolls vs another set of rolls. Chapter 3 details Focuses, Talents and Specializations. Every Ability has multiple focuses. The Fighting Ability has a focus on Axes and another, Polearms for example. You can gain a new focus for everytime you go up a level. Talents are something else. These are only granted under special circumstances. They might be restricted by class and many have prereqs. These include abilities like Animal Training, Dual Weapon Fighting, or Psychic. Specializations can almost be thought of as "Sub Classes", these include Assassin, Elementalist, and the like. Chapter 4 gives us basic equipment. Pretty self-explanatory. Chapter 5 covers Magic and the magical arts. While anyone can have arcane ability, only Mages can master them. There are 12 Arcana here with various magical powers. Chapter 6 details Stunts. These are the life, and soul of the AGE system really. If you get doubles on any roll of the dice you may perform a Stunt on that roll. So if the roll was a combat situation then you can perform a Combat Stunt. The roll you get on your Drama Die (the off color one) is a number of Stunt Points you get. You have to use them right away. So if you get a 4 you have 4 SP and can buy any of the stunts listed for 4 or under. These are things like "Knock Prone" or "Lethal Blow". As characters go up in level they gain access to more stunts and can buy others for less SP. There are also non-combat Exploration and Role-playing Stunts as well. There are even Arcane Stunts that can be used in either. Chapter 7 is the GM's Section. This covers running adventures and adjudicating the rules. There is a good section on adventure planning that is good for most games. Chapter 8 is about Mastering the Rules and dealing with ability tests and combat. Chapter 9 covers Adversaries and Monsters. All the regulars are here. Chapter 10 is all about rewards. Which includes, but is not limited to, treasure. Chapter 11 gives us our hook to Freeport, GR long-running setting and Chapter 12 is an adventure. Fantasy AGE is a solid fantasy game that keeps from being a Heartbreaker and carves out new territory of it's own. I have said it hundreds of time, but you can never have too many monster books. Fantasy AGE Bestiary is one of my favorites. This is not a rehashed monster manual. This 144-page book is stocked full of really cool, really interesting and often unique monsters. Sure some are familiar, but that is not the point, the point is that this book is full and it will be a long time before I run out of ideas for them all. The art is fantastic and that is a great thing in a monster book. Each monster is listed with stats, picture, background information and plot hook ideas. The book is so good in fact if makes me want Green Ronin to publish it with D&D 5e stats as well. If you are a fan of Fantasy AGE or Blue Rose or DragonAge then this is a must have book. Can't wait to do more with these books! 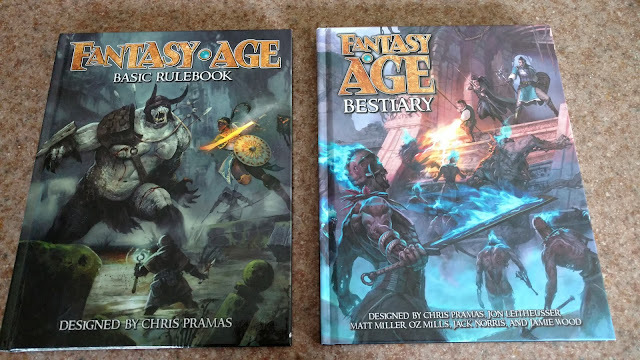 I had a look at a friend's copy of the AGE rulebook and whilst I love the system (I do own Dragon AGE and now Blue Rose AGE) I have two problems with the rulebook that has put me off buying it - for now. 1 is the lack of magic. It has some but not that many spells for each discipline which does annoy me. 2 is the lack of a decent list of creatures. 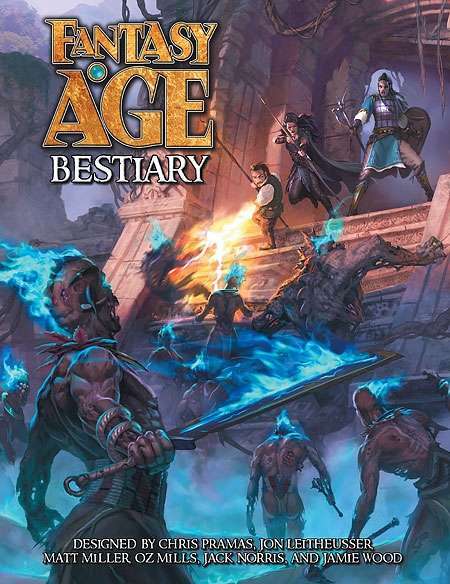 For me they could easily have done a decent bestiary and bigger spell list, added 100 pages and sold it for £29.99 (as opposed to the £19.99 it currently goes for). Like D&D and pathfinder, the bestiary and soon to be released advanced player's handbook (providing more spells) seem more of a cash grab than actually being a necessity and that annoys me. What I love about Dragon Age and Blue Rose Age is that its one book, with everything you need in that one book (unless you want the Gm Screen). So it is a good generic application of the AGE system (I am intrigued by the upcoming AGE modern) but I think it could have been better. I think I may hold off and see if they do a deluxe with the main book, bestiary and advanced player's book released as one volume. I really like the AGE system. I've used it for several games. Dragon Age also. But I am not a fan of the magic system. I preferred the system Dragon Age used over Fantasy Age. It was easy to port over. What these modern "loose" systems taught us is that you can actually play with the core rules for years if you're flexible enough to create home content and expand on basic concept. We didn't need another pathfinder (thank god), we need more games like this where modernity and the old school simplicity mesh together to bring at the table a completely new experience. With the focus you can actually tell a lot about who you are and even make odd choices like "drinkin" or insert special rules for crafting, just BtB. I really hope this game do not get anymore complicated. I may find useful having more Arcana choices tho, but just with the basic ones you still can create a lot of game conecepts (like, say, an Earth / Healing combat mage, a "clayrvoiance" Fate / Power / Divination hunter) or even a pure old school Priest with Healing, Heroic and Fire... or a Druid with Earth, Water and Wood + beast).